Early Warning: Peak Canadian Wood? A new report on the mountain pine beetle epidemic describes it as one of North America’s largest natural environmental disasters that will put an estimated 16 major sawmills out of business in B.C. and lead to long-term lumber shortages in the United States. “We sort of think lumber production has peaked forever, at least relative to our lifetimes and our children’s lifetimes.” said Russell Taylor, president of the International Wood Markets Group. The Vancouver-based consulting company is one of three consultants who prepared the report for lumber industry clients. Coupled with reductions in the Ontario and Quebec timber supplies, the pine beetle epidemic is expected to reduce Canada’s share of the U.S. lumber market by 50 per cent. Lumber prices are expected to soar. 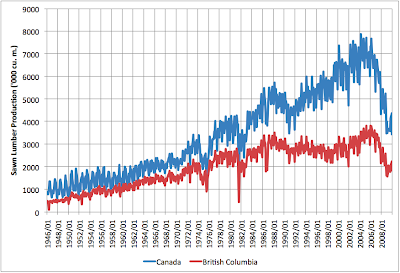 However, lumber volumes in B.C. will never recover to the 2005 levels, when a booming U.S. housing industry fuelled expansion in this province, Taylor said. The report forecasts a long-term sawlog supply from the B.C. Interior that’s roughly equivalent to the volume harvested in 2009, a year full of market-driven sawmill closures that’s widely considered to be the worst year in memory for the forest industry. Lumber production will pick up this year and continue to rise until 2013. But by 2015, it will have peaked, and begin falling again as sawlog-quality pine becomes scarce. That sounds like a formidable amount of economic impact, due to something that is likely to be, at least in part, a climate change consequence. Unfortunately, as so often with these kinds of reports from private industry analysts, the report costs $1100, so we have no easy way to verify the analysis for ourselves and decide whether we agree or not. What I did do, however, was go off to Statistics Canada, and paid my $6 to get two series from table 303-0009, for sawn lumber production both for Canada as a whole, and British Columbia in particular. The data run from Jan 1946 through December 2009. The effect of the beetle on future production, I can't speak to. 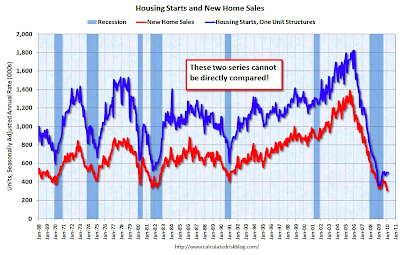 But to understand that graph, you need to also include a look at US new home sales. In Ontario, we have trees galore and no beetle but the softwood industry is a fraction of what it was. Economics. Agreed (the last paragraph of the quote I included from the Vancouver Sun mentions this).